In this paper, we propose hPIN/hTAN, a low-cost hardware token based PIN/TAN system for protecting e-banking systems against the strong threat model where the adversary has full control over the user's computer. This threat model covers various kinds of attacks related to untrusted terminal computers, such as keyloggers/screenloggers, session hijackers, Trojan horses and transaction generators. The core of hPIN/hTAN is a secure and easy user-computer-token interface. The security is guaranteed by the user-computer-token interface and two underlying security protocols for user/server/transaction authentication. The hPIN/hTAN system is designed as an open framework so that the underlying authentication protocols can be easily reconfigured. To minimize the costs and maximize usability, we chose two security protocols dependent on simple cryptography (a cryptographic hash function and a random number generator). In contrast to other existing hardware-based solutions, hPIN/hTAN depends on neither a second trusted channel nor a secure keypad nor external trusted center. Our prototype implementation does not involve cryptography beyond a cryptographic hash function. The minimalistic design not only enhances usability but also increases security since more complicated systems tend to have more security holes and software bugs. As an important feature, hPIN/hTAN exploits the human user's active involvement in the whole process to compensate security weaknesses caused by careless human behavior. Step 1: U connects T to C, and presses the “OK” button on T.
Step 2: U enters IDU on the untrusted keyboard and sends it to T via C.
Step 3: For i=1, …, n, T and U perform the following interactive protocol to enter PIN. Step 4: T verifies if PIN* = HMAC(KT* ⊕ h(PIN || s), PIN || s). If so, then T recovers the secret key as KT = KT* ⊕ h(PIN || s), stores h(KT) in its volatile memory for future use in the hTAN part, shows a "PIN correct" message to the user U via its display, and goes to Step 5; otherwise T performs CT++, shows an alert to U and stops. If CT > VT, T locks itself. 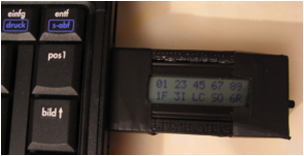 Here, VT is a parameter controlling the security against random guess attack of the PIN. Step 6: T shows a message on its display to inform U about the result of the mutual authentication protocol in Step 5. Legend: Dashed lines denote information display, and bold lines should the reconfigurable part. Step 1: U clicks a button on the e-banking web page to inform T about the start of a new online transaction. Then, she inputs each sensitive transaction data (STD) item one after another on the untrusted keyboard of C by repeating Steps 1-4. To embed STD verification into the input process, each character in the STD is shown as an asterisk "*" on the untrusted monitor of C, but in clear on the trusted display of T. This can naturally force U to verify the STD simultaneously while she is entering the STD. If U presses key, T shows an eye-catching warning message to inform the user for a few seconds and then the previously entered character is deleted. Step 2: Upon completion of current STD item, U presses the "OK" button on T.
Step 3: T highlights current STD item for a few seconds, and prompts U to press the "OK" button again if the current STD item was not changed by C after Step 2. Step 4: U presses the "OK" button again to approve the current STD item. 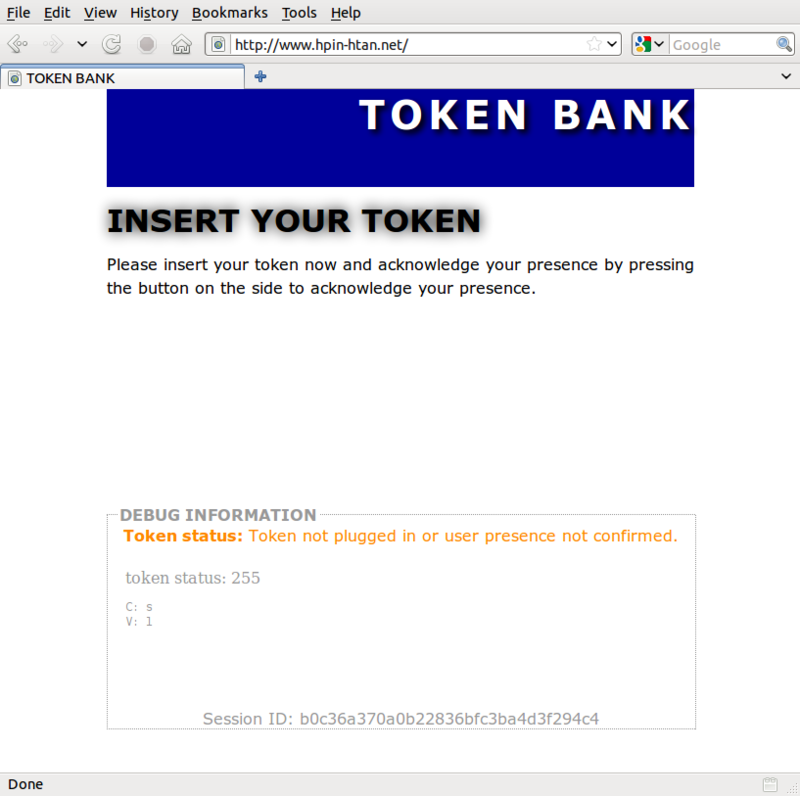 Step 5: U inputs non-sensitive transaction data (NSTD) to T by filling a blank on the web page in clear. where rT and rS are two new nonces generated by T and S, respectively. Step 7: S checks if H4 = HMAC(h(KT); rT || rS || STD). If so, S executes the requested transaction and sets M = "success", otherwise sets M = "error". Then, S sends H5 = HMAC(h(KT); rS || rT || M || STD) to T.
Step 8: T checks if H5 = HMAC(h(KT); rS || rT || "success" || STD). If so, it shows "transaction executed", otherwise "transaction failed", on its display. How lightweight is the token? How low-cost is the token? Actual costs of mass production: ≤ 5 € per token? Batch purchase is always much cheaper! Programming costs per token is negligible: 3 man months / O(100,000) << 1 €. In the published edition of the paper, the SKID3 protocol in Step 5 of hPIN protocol is erroneous, which was caused by a mistake when we made some changes to the description of hPIN protocol. In addition, in both hPIN and hTAN protocols, the key used in HMAC should be h(KT), not KT. This is a typo we made in the paper writing. We apologize for making these errors. And in the hTAN protocol, KT should be replaced by h(KT) wherever it appears. Yet another error is about PIN* which is represented by two different equations: h(PIN || KT || s) and HMAC(KT, PIN || s). Since the latter is more general, so it should be used to replace the former. Only one revision exists, which was created (or modified) by hooklee at Sunday, June 19, 2016 11:10:54 PM.